Alright, so you've been watching the Food Network like it's your job. You've learned all about tenderizing, marination, and deglazing. You've cultured yourself with cooking techniques from every corner of the world. You've perfected the art of engastration and you can prepare the turducken to prove it! So, now it's time. Time for what, you ask? Time to let the world know that you are, indeed, a master of the culinary arts. Don't go around simply telling everyone that you're an exquisite culinary artist or that your cookery is unmatched, but rather show them. Not by displaying your ability to prepare, cook, and present a 5-star meal, but by dressing like a world-class culinarian. 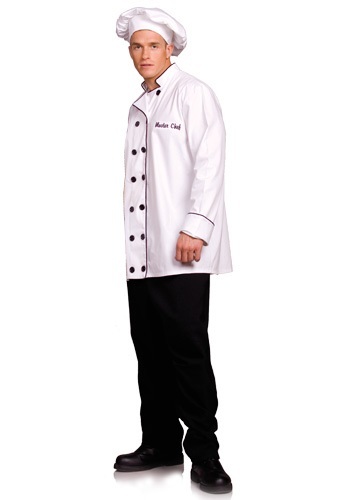 Grab this Chef Costume and no one will be able to deny your status as a cooking champion. Once you button up this classic cook's double-breasted coat and top off your new outfit with the traditional chef's hat you're whole life will change. Respected restaurants and hotels will beg you to work in their kitchens. Up and coming cooks will travel from far and wide just to learn from you. Other culinary masters will begin to hunt you down in order to challenge you on the streets to a cook-out. As long as you keep your senses sharp and continue improving your skills, you'll never be beaten and retain your title as an Iron Chef. Get your hands on this Chef Costume and start putting that vast knowledge of food science, nutrition, and diet to use. After all, you haven't been spending hours of your day watching marathons of cooking shows for nothing!